“If there is magic on this planet, it is contained in water,” — Loren Eiseley. The place of flowing water is the Owens Valley, as it is now more commonly known. It was once a wet, flood plain where water flowed into a large lake at the southern end of the valley. 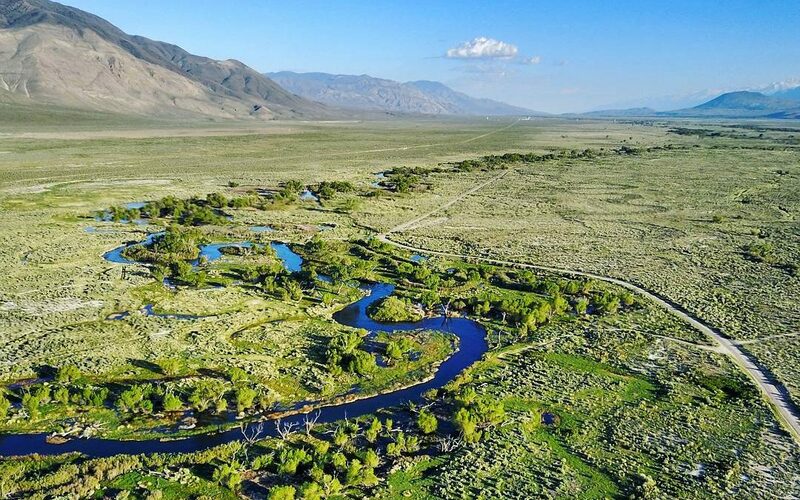 The Owens River still weaves its way through this beautiful valley and water, once again, flows all the way to the lakebed and into large ponds that are home to a remarkable variety of resident and migratory birds. The semi-arid and spectacular landscape of the Owens Valley is characterized as ‘high desert’. This is a term loosely used to describe regions that are around 4,000 feet above sea level and receive less than 10 inches of precipitation per year. 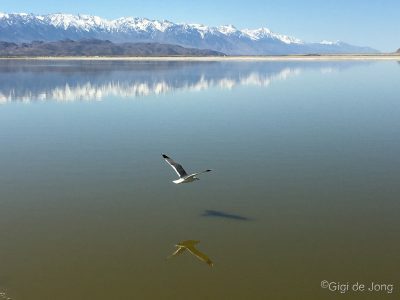 Situated at an altitude of 3,500 ft at the southern end of the valley, the Owens Lake (dry), and 4,500 ft at the northern end of the valley, just north of Bishop, and averaging just under 5 inches of precipitation annually – the Owens Valley clearly fits these high desert criteria. And yet … it is far from dry! What differentiates it from other high desert regions of the western United States is that it is flanked by some of the highest mountain ranges on the continent. The mountains that rise up along the eastern side of the valley, the White and Inyo Mountain ranges, receive significantly more precipitation than the valley floor, up to 18” annually in some places at the upper elevations. But it is the range on the western side of the valley, the magnificent and well-known Sierra Nevada, that produces the water that runs into the valley and down the Owens River. Because the range rises to well over 9,000 ft along most of its 450 miles, with over 120 peaks above 13,000 ft, it is the ‘water trap’ that causes precipitation to fall from the moisture-laden airmasses that originate in the Pacific Ocean and move eastward. During the fall, winter, and spring between 20 to 80 inches of precipitation can occur, most of it in the form of snow above 6,000 feet. Much of it falls on the western slopes and crest of the range, causing the mountains to cast a ‘rain shadow’ over the Owens Valley. The ‘water trap’. The Sierra Nevada. 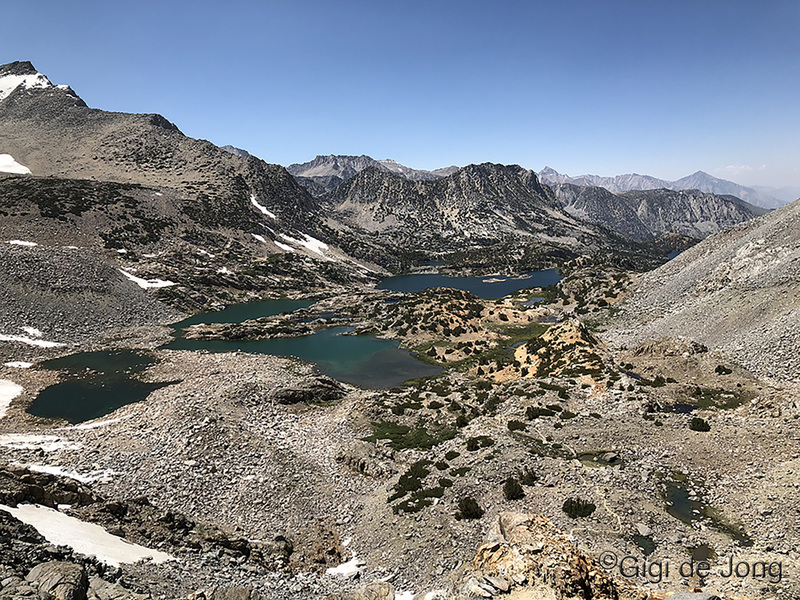 During the summer, and warmer periods of the year, the snow and ice melts into innumerable glacial lakes and flows down into more lakes and creeks and eventually into the Owens River. Many areas of snow and ice don’t completely melt during the summer, some of these forming true glaciers, and so there is a constant supply of water year-round. 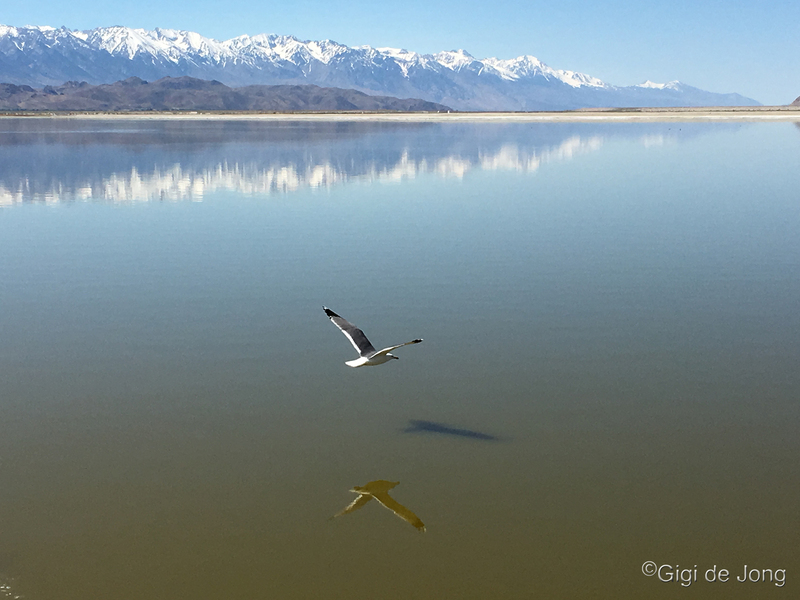 All this water and the fact that Bishop and the Owens Valley have about a 92% chance of dry days, means that an adventure in the heart of the Eastern Sierra offers 335 sunny days a year to spend by the water. There are three general regions of the Owens Valley and the eastern slopes of the Sierra Nevada that are differentiated by climate and altitude. Each of these has distinctive types of water bodies that are best suited to specific water activities and specific times of the year. 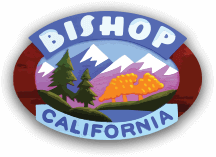 Situated at the north end of the Owens Valley, which is about 20 miles wide here, is the beautiful town of Bishop. A network of creeks and canals, that began as streams and trickles high up in the Sierra Nevada, run through the town. These were once, and in some cases still are, irrigation sources for farmers and livestock. And these creeks still provide much needed water for keeping the fields and neighborhoods treed and green. The perennial Owens River flows down from the escarpment above Bishop, through the deep gorge it has cut during the last 750,000 years. It weaves sinuously around the town and south to the Owens Lake and as it does it creates a verdant, riparian area along its banks. The tributaries that flow through town, and into the Owens River at points along its journey south, broaden into pools and ponds where life flourishes. As you look out over this expanse of high desert scrub it’s hard to see all the water that courses through this valley. It gives life to all the fauna and flora – the spreading cottonwood trees along the river banks, the alkali meadows with a rich tapestry of wildflowers, the myriad of insects, birds, rodents, amphibians and mammals. This desert is alive and well. We too are a part of it. The water sustains us and gives us pleasure. Water sports are year-round in the lowlands with swimming, fishing, and boating enjoyed by residents and visitors in our big backyard. In summertime, ‘floating the river’ is a favorite activity. Even though daytime temperatures can soar over the 100 deg mark, a float tube ride on the slow, smooth water of the river is cooling and relaxing. A late afternoon swim in one of the artesian wells or spring-fed ponds is sublime on a hot summer day. Fly fishing anywhere along the river is fantastic, and legal, every day of the year! Fishing in the Buckley Ponds just east of Bishop can yield bass, bluegill, carp and even catfish and is a wonderful wintertime fishing experience. Camping at the water’s edge in the Pleasant Valley Owens River campground is serene and peaceful, especially in spring and fall. If you’re into the daytime experience, but want a comfortable pillow, dip in a swimming pool, and a proper bed to sleep in, Bishop has plenty of hotel options that will lull you to sleep too. The Sierra Nevada rises dramatically and steeply on its eastern flanks with no real foothills to mark its rise from the lowlands here. The Tungsten Hills and Buttermilk Country appear to be foothills, but these hills are the result of a combination of alluvial fill and deposits by glacial action from the last ice age. The underlying rock and sediment of these hills is quite different to the massive mountains nearby, and the large boulders that are strewn on these hillsides were pushed by advancing glaciers and then ‘left there’ once the glaciers retreated. At the same time, the glaciers pushed sediment ahead and outward creating the large well-defined moraines, which channel the creeks that flow from the high country. The creeks as we know them today took various paths down this changing landscape eons ago, sometimes flowing in the opposite direction and other times over and around obstacles that have long-since disappeared. Fewer channels exist in this upper scrub zone, but plenty of water flows from the mountains and nourishes the land and its inhabitants as it goes. No wonder this region beckons geologists, climbers and boulderers from all over the world! The Buttermilk Country is best known as a world-class bouldering destination and there are a number of lovely, remote settings among these hills to camp alongside the creeks here. One picturesque spot is the Buttermilk waterfall, where the consistent flow of McGee creek has sculpted a sweet, little canyon in the soft rock of these hills. These hills are a wonderful area for winter hiking, mountain biking, and OHV exploring. Higher up the basin, and into the trees of the sub-alpine zone, lovely primitive campsites on the banks of the creek are accessible in late spring, summer, and early fall. This broad basin is bounded by two pristine and magnificent examples of glacial canyons – Pine Creek Canyon to the northeast and Bishop Creek Canyon southwest of the basin. It is in these canyons that the waters run fast and cool among the montane forests of the eastern Sierra. Pine Creek is the place to get away for a secluded adventure. The dispersed campsites alongside the creek are nestled in the trees and offer shelter from the summer sun and privacy from other visitors. Trailheads at the top of the canyon provide access to the John Muir Wilderness. From late spring to early fall Pine Creek Canyon has excellent opportunities for fishing, hiking, and climbing. With close, easy access on a paved road from Bishop (just a 20-minute drive) this canyon is the closest, coolest, and quietest summer escape from the high desert heat. 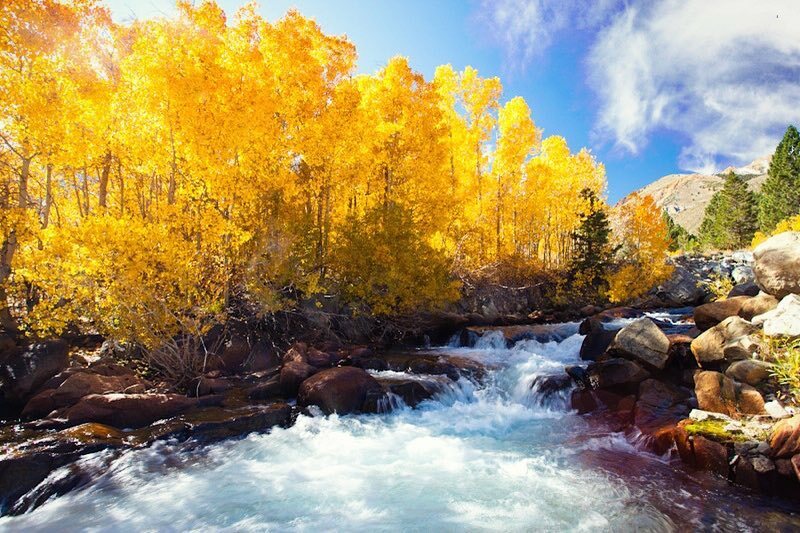 Bishop Creek Canyon is the ‘pièce de résistance’ for water fun and summer sun. There are few regions along the eastern Sierra that can match the beauty or deliver the amenities that this magnificent canyon can! It is an area of about 30 square miles where the North, Middle, and South Forks of Bishop Creek drain down toward the Owens Valley. At the head of each fork is a large lake – North Lake, Lake Sabrina, and South Lake (respectively) and numerous other smaller lakes lie along these creeks. 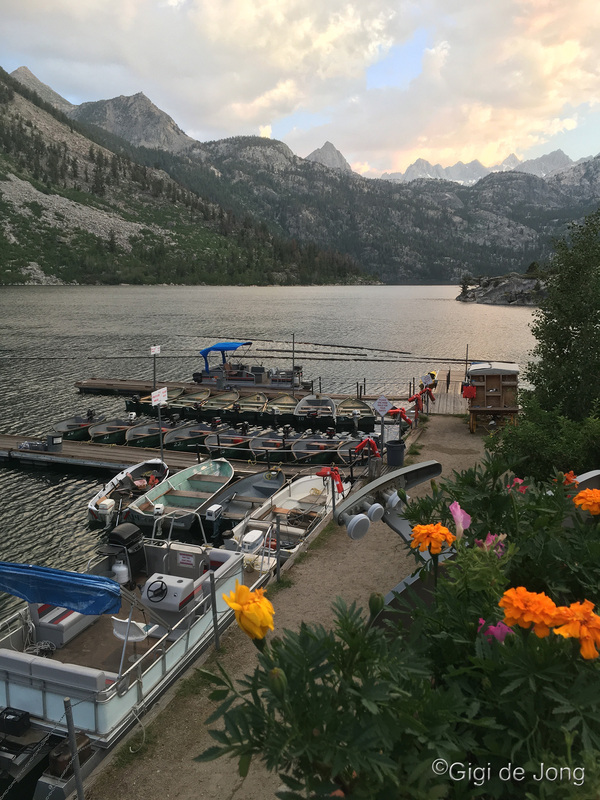 Lake Sabrina – view from the café patio. There are 12 USFS developed campgrounds that are perfectly situated and provide a variety of camping from tent to RV camping, with two especially designated for groups. All are well maintained and most serviced. All but one, at North Lake, are easily accessible by paved roads. The streams and lakes are regularly stocked with fish and miles of trails offer easy access to swift waters and calm lakes. The larger lakes are also great for stand-up paddle boarding, kayaking, swimming, and boating. A boat dock with boat rentals and a café are located at Lake Sabrina. This is a truly magical place for an afternoon outing or weekend getaway. In addition to the US Forest Service camping in Bishop Creek Canyon are the lovely private resorts. Each has its own unique characteristics and services. They offer a range of facilities from full-hookup RV sites to beautifully appointed and comfortable cabins, plus cafés, souvenir and gift stores, rentals, horseback riding, and guide services. To further whet your whistle, Bishop Creek Lodge serves the best big mug of cold beer and burger, and Cardinal Village Resort dishes up all you can eat stone-fired gourmet pizza Thursday-Saturday on summer nights. It’s something special that each and every person on this green earth should experience. Lake Sabrina Boat Landing has the best “eats” view for water lovers. Summer: camping, hiking, fishing, boating, paddling, bird watching, picnicking, photography, plein air painting, and … well, it’s almost unlimited. Winter: cross country skiing, snowshoeing, and super fun resort activities during the holiday season. Spring: as soon as it thaws … get started on it all again! The water begins where the trees end. Winter snowfall starts at this elevation sooner than lower down and sometimes snow even falls here in summer. It does melt quickly at this time of year, but it accumulates as the seasons change through fall to winter and into spring. 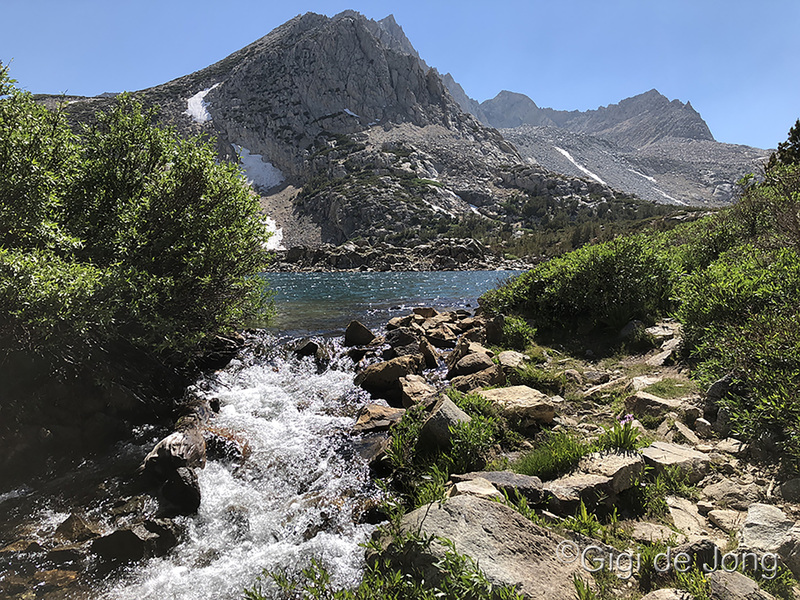 Then the melt starts again and the water drips and trickles and cascades into naturally occurring lakes, down canyons, and into the creeks that quench the thirsty plant, animal and human life of the eastern Sierra. This is the place where waterfalls are born. 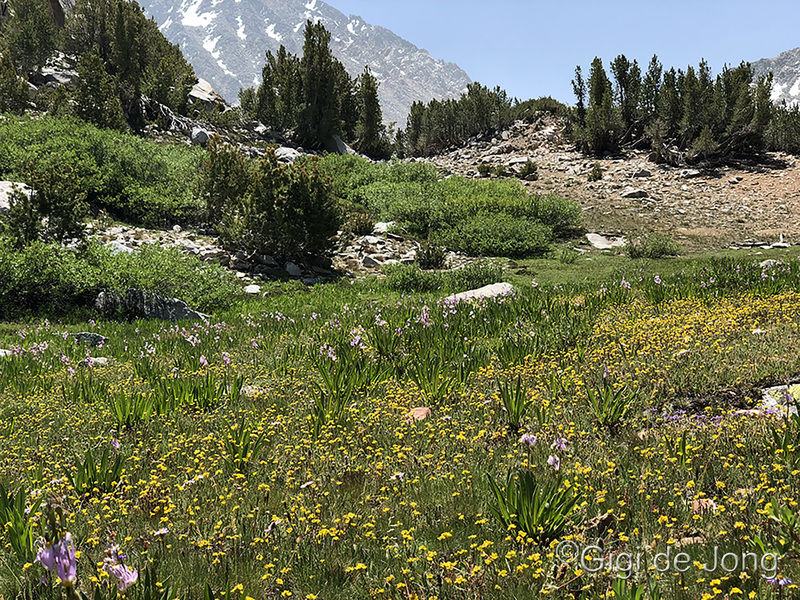 Above the tree line, in this alpine zone, grasses and wildflowers are the predominant vegetation type. This vast and seemingly bare mountainscape is a rich floral rock garden. An extensive variety of annuals, perennials, shrubs, ferns, lichens and fungi can grow in suitable environments. Where erosion has scoured the rock to produce enough soil, receding lakes give way to marshland that produces carpets of color and beautiful bouquets of flowers. The floral bloom in the Sierra Nevada alpine zone is considered by botanists to be one of California’s foremost wildflower displays. The trailheads in Bishop Creek Canyon offer some of the best access to the John Muir and Pacific Crest Trails. Thousands of people hike these trails every year. Some will hike them from beginning to end and others will take the time to enjoy short sections of these trails. Still more will hike the access trails just for a day trip. But it’s always astonishing how quiet it is and how few people you see the higher you go. It’s an experience of wilderness and solitude, or adventure and camaraderie, or all of these that is exhilarating and exceptional. The abundance of water in the Sierra Nevada is the reason that people and animals can spend many weeks and travel long distances along the trails of the high Sierra. Without this consistent supply of water, which should always be filtered or treated for human consumption, hiking and camping along these world renown trails would be far more taxing and far less hospitable. Water makes this all possible. Bishop and the Owens Valley are the fortunate recipients of this water. We invite you to visit and enjoy our big backyard – the place of flowing water. 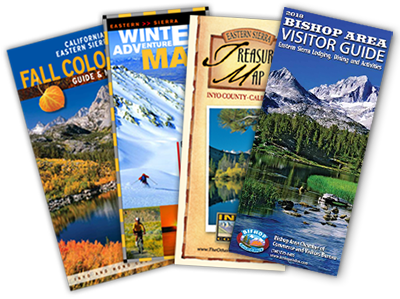 , or stop in at 690 N. Main Street and chat with our water-wise staff about all these destinations and activities on, in, and by the water. Many activities are seasonal, and our hosts can tell you more about what is best at which time of year and inform you about current conditions. Fast flowing water can be dangerous. Always be prepared with personal floatation devices when and where necessary. Have enough changes of clothing to stay dry. Always wear a hat and sunscreen whenever you’re outdoors. And don’t forget your sunglasses! Tell someone where you’re going and when you expect to be back. Fishing requires a valid California fishing license, except on the two free fishing days each year – usually around the July 4th holiday and Labor Day weekend. Permits are required when traveling in the wilderness. Please pack out everything you pack in with you. Most trailheads and campgrounds are serviced, but every bit you do to help keep our big backyard clean and lovely is very much appreciated.